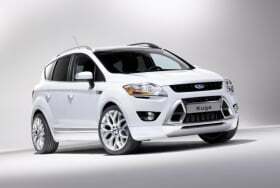 The Ford Kuga finished 2009 as Europe's No. 2 selling SUV with a volume of 64,546 units. Ford Motor Co. will unveil a near-production-ready concept of a medium SUV to replace the Kuga in Europe and Escape in the United States next month at the Detroit auto show, a Ford source told Automotive News Europe. The vehicle will go into production in the second half of 2012 and be sold as a 2013 model in the United States, the source said. Ford of Europe declined to comment. Ford has not decided whether the Kuga and Escape will keep their names or share a common badge when the new-generation SUVs arrive. The U.S. automaker's One Ford strategy calls for a single name for vehicles sold in different regions, such as the Fiesta and Focus. It's likely that Ford of Europe's Saarlouis, Germany, plant will lose production of the Kuga to one of the company's U.S. plants. The front-runner for the job is Ford's factory in Louisville, Kentucky, where it makes the Ford Explorer large SUV. Ford makes the Escape, including a hybrid variant, in Kansas City, Missouri. Output of the Focus, which went into production on Monday, will probably reach the daily maximum of 1,850 cars by the end of January, Bernhard Mattes, who runs Ford's German factories, told Bloomberg this week. The car will go on sale as early as March in Germany and be available in other major European markets by the second quarter, Mattes said. The next-generation Ford Kuga is one of 10 models Ford will build on its new global C architecture, which debuted this year with the C-Max medium minivan. Ford plans to produce 2 million units a year off the architecture. Vehicles underpinned by architecture share about 80 percent of parts whether built in the U.S., Europe, Russia or China. Introduced at the Geneva auto show in March 2008, the Kuga has been a hot seller in Europe since replacing the Maverick, which was a slow-selling U.S.-made rebadged version of the Escape. In 2009, the Kuga finished its first full year on the market as Europe's No. 2 selling SUV after the Volkswagen Tiguan with a volume of 64,546 units. VW sold 107,897 Tiguans in 2009, according to market researcher JATO Dynamics. Through 10 months, Kuga sales are up 16.6 percent to 61,146 units. The surge brought it closer to the Tiguan, which had flat sales after 10 months at 89,301 units.